(9th century b.c.e.) 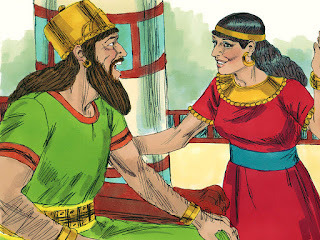 king and queen of Samaria King Ahab and Queen Jezebel were the royal couple of Israel most vilified by later biblical writers, yet it is Ahab who made Israel and its army one of the strongest on the stage of Near Eastern nations and powers in the early ninth century b.c.e. He fortified and beautified the newly founded capital of Israel, Samaria. Archaeological excavations show that during his reign cities in various regions of his kingdom were built up so that Israel could withstand attack from neighboring peoples. His reputation gained the attention of the Phoenicians to the north so that one of their priestkings offered his daughter Jezebel to Ahab in an arranged political marriage. him to gain concessions from the Arameans. The real challenge came from the traditional hotbed of imperial ambition, Mesopotamia. Here the fierce Assyrians were mobilizing their forces to re-establish their empire in the western end of the Fertile Crescent. Only a makeshift alliance of all the kingdoms could stand in Assyria’s way. The Assyrian records tell of a battlefield victory at Qarqar (853 b.c.e.) in the Orontes Valley in the coastal region of present-day Syria, but it was not decisive enough for the victors to push on toward their goal. Phoenicia was not even touched, much less Israel. Other minor losses for Israel during this time are reported in the Moabite Stone: A small region far to the southeast (present-day Jordan) seceded from the hegemony. Ahab also knew how to run the internal affairs of a state. He relied on the new capital of Samaria to integrate the non-Israelite interest groups, chiefly the advocates of Baal and Asherah worship, while the older city of Jezreel served as residence to the traditional elements of Israelite culture. This balance suggests that Ahab allowed the building of foreign temples, though he showed some wavering attachment to the Israelite God. achieve dominance for her religion and dynasty. She tried to eliminate the all-traditional prophets in Israel and plotted against the famous prophet Elijah. she could rule for six years after her son died. prophetess who gives license to immorality and idolatry under the cloak of religion.